Why this subject? I love Unicode, and I even adopted a character (I’ll let you guess which one). Lots of research has been done on Unicode security issues, but not many people talk about it. Unicode was created to provide an expandable character set to encompass more languages than the standard Latin alphabet can express. Complexity is the damnable enemy of security, but human language is complex so what can you do? I’m hoping this short article will act as a setup for future research on the subject of Unicode security, by giving you some basic information, and will encourage others who are better at exploit development than me to look into it. ISO/IEC 8859 uses the last bit to add another 96+ characters, as well as control characters. You have to specify a code page/language in order to determine which character set to which those 96 will belong. This was okay for a bit, but was still not enough to encompass all languages and did not allow for several of the mixed languages. The goal was to represent all the characters as unique code points, and not get confused amongst languages or what characters should be used (as often happens with the “smart quote”, hyphens, and so on within Windows). If Windows-1252 is confused for ISO 8859-1, you get � for these characters. This regularly causes me fits when I’m working with metadata for con videos. It also sometimes makes copying and pasting commands in tutorials a pain if the document editor decides to replace underscores and quotes. Related trivia: ever see a random ‘J’ in an email? That’s because some Microsoft products express a ? as a J from the Wingdings font. Anyway, back to Unicode’s history. Joe Becker (Xerox), Lee Collins, and Mark Davis (Apple) started working on Unicode in 1987 to make a more flexible character encoding system. Unicode version 1.0.0 was released in October 1991. Unicode started as a 16-bit character model (0x0-0xFFFF), with the first 256 code points being the same as ISO-8859-1 (Latin-1). This has since been expanded, so that Unicode has points from 0x0 to 0x10FFFF (1,114,112 points in decimal – 24 bits), though support for versions of Unicode varies. For example, Unicode 10.0 was approved June 20, 2017, but likely is not supported on your platform yet or this ? (U+1F994) would look like a hedgehog. While Unicode is highly expandable, most points you will use will likely be in the Basic Multilingual Plane (BMP) represented as U+0000 to U+FFFF. There are several Unicode encoding formats and this is where a lot of the complexity is derived. UTF-8 (UCS Transformation Format 8-bit) is meant to be backward compatible with ASCII, so the first 256 characters are the same as ISO-8859-1. 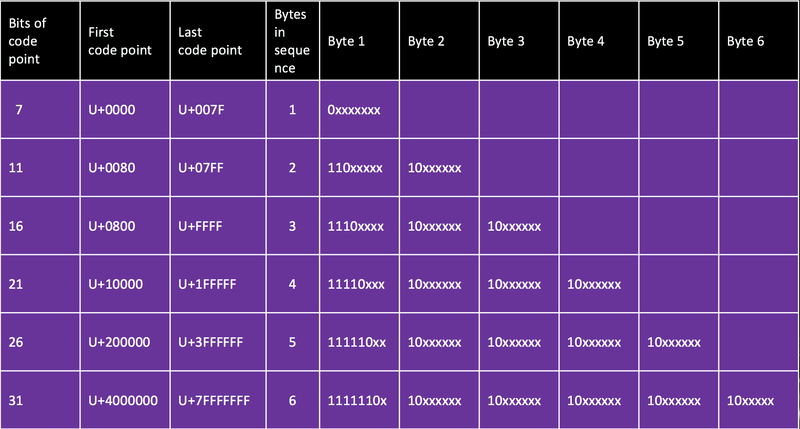 Higher characters are encoded using more than one byte by adding unused surrogate pairs in range 0xD800 to 0xD8FF. The advantage of UTF-8 is if an application was only written for ASCII, it will still understand those characters. UCS-2 started off as just a 16 bit representation of the character’s code point, but was superseded by UTF-16 (Unicode Transformation Format 16-bit), which uses a surrogate pairs system similar to UTF-8. 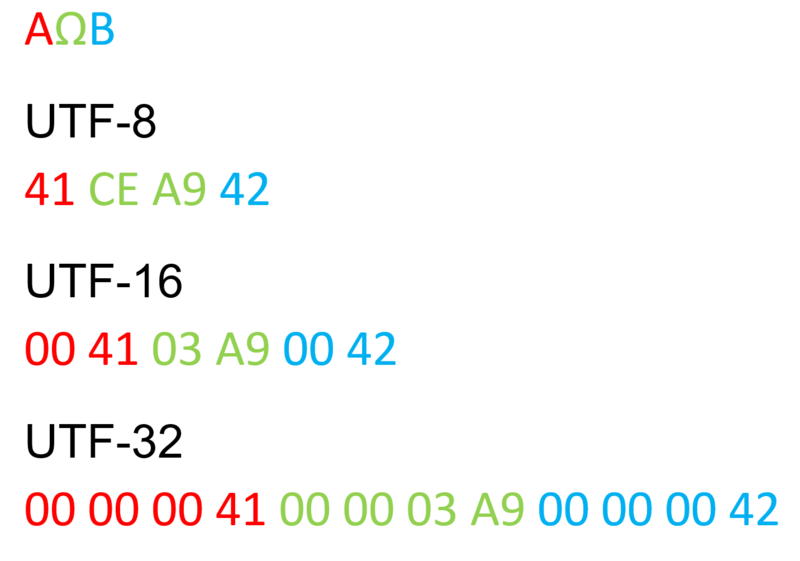 UTF-32 (Unicode Transformation Format 32-bit) uses a straight one-to-one correlation between the code point and a 32-bit number. UTF-8 prepends EFBBBF to data. UTF-16 prepends FEFF Unicode for Big Endian and FFFE for Little Endian. UTF-32 generally does not use one. 0x10000 is subtracted from the code point, leaving a 20-bit number in the range 0x0 to.0xFFFFF. The upper ten bits (a number in the range 0x0 to 0x3FF) are added to 0xD800 to give the first code unit or lead surrogate, which will be in the range 0xD800 to 0xDBFF. The lower ten bits (also in the range 0x0 to 0x3FF) are added to 0xDC00 to give the second code unit or trail surrogate, which will be in the range 0xDC00 to 0xDFFF (previous versions of the Unicode Standard referred to these as low surrogates). Anyway, as you can see things get complex quickly. A̜͈̭͈͔͍̲d̳͙̯̫̗d̮ ͙͖͔͈o̜͍n ͓̤̲̣̗͘c̝͍͚̞͞o̵̞̣͖m̸̭̰͇͚̠b̭̤̲̣̖̪̭̀i̸̱̩n҉̫̤̹̯̭i͓̣̯̰͔ͅn͝g͍̕ ͅd̬̻̹̗̜͕̥i̤͘a͇̩͉̺͇̝̮c̳̤̺̹̙r҉̗̭̠i͢t͇̺̮̞̯i̜̣c̫̰̫̟̥s̭̦̬ ͏̣̺͓and weird rendering issues, and you can see where people might screw up in code when programming around Unicode. Ok, enough background, let’s talk about potential security concerns . . .
are represented in both the U+0021-007E (Basic Latin) and the U+FF01-FF5E (Full width Latin) ranges of Unicode. This means changing from one encoding for a given Latin character to the other is as easy as adding the decimal value 65248 to the lower range versions. Depending on the font used, mixing character families this way may cause a “Ransom Note” like visual effect, because the exact vertical and horizontal spacing of the characters may vary. While the intended purpose of Internationalizing Domain Names in Applications (IDNA) is to allow for internationalized DNS labels, it can also be used to make a URL or hostname appear more legitimate than it really is. Because the Unicode representation may cause visual confusion for a user, it could provide a false sense of trust. Besides URLs, homoglyph attacks can be used in social media to cause confusion. Most services seem to be restrictive on characters allowed, but some homoglyphs exist in standard ASCII. For example ‘dave_rel1k’ and ‘dave_reI1k’ can be two different accounts. Another weird thing I’ve found is people using homoglyphs to confuse searches. For example, a search for a drug’s name, and a modified name with a homoglyph, return different results. Notice the difference in a Google search for mеth (e is codepoint U+0435) and meth. I’m not sure exactly what the purpose of people doing this is. To confuse search engines and bypass filters I guess. Steganography is not taken seriously by some, but it’s still fun to play with. Using a combination of homoglyphs and non-printable characters I came up with a few ways to encode hidden text. Ｔhiｓ iｓ ｍｙ ｃoveｒ text ｔｏ ｕｓｅ． Dｏ ｙｏｕ ｔhiｎk ｉt wｉｌｌ woｒk？ Ｉ hｏpe ｔｈａｔ ｉt will. But as you see, it has a “Ransom Note” effect that gives it away. Another option is to use very close homoglyphs to encode single bits. Skip if there are no close homoglyphs, use 8 types of space like characters (U+0020, U+2004, U+2005, U+2006, U+2008, U+2009, U+202F, U+205F) to encode 3 bits each (000,001,010,011,100,101,110,111). Τhiѕ іѕ my cover tехt tο usе. Dο yοu thіnk іt wіll wοrk? I һοре that it will. Another system is to use non printable Tags in U+E0000 to U+E007F. Also easy – just add/subtract 0xE0000. This ?is ?my ?cover ?text ?to ?use. ?Do ?you ?think ?it will work? I hope that it will. In the example above, the “Just a text file about annexe.txt” is really “Just a text file about ann U+202E txt.exe”. This could make a dropped thumbdrive scenario look more plausible. Some characters are encoded multiple times in Unicode. Let’s think of an XSS filter. What if < or > are filtered before canonicalization? If it also tries to canonicalize similar characters like < (U+003c), >(U+003e), ‹ (U+2039), ﹤ (U+FE64), ﹥ (U+FE65) › (U+203a), ＜(U+ff1c), ＞(U+ff1e) after filtering, the filter would be bypassed. A real-life example would be Spotify. The canonical_username function was not “idempotent” (only first time matters), so this functions like a “toLower” command. The user signs up with username ‘IronGeek’, which gets normalized to ‘irongeek’. Which also gets normalized to ‘IRONGEEK’ the first time, but ‘irongeek’ the next time. The ᴵᴿᴼᴺᴳᴱᴱᴷ account can then request a password reset email, but with it can reset the ‘IronGeek’ account. 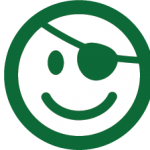 I’d like to leave you with some links to great tools and resources about Unicode. May have to edit HKEY_Current_User/Control Panel/Input Method and set EnableHexNumpad to “1“.